THE PLASTIC FANGS ARE AN EXPLOSIVE UNSIGNED BRISBANE ACT WHO CREATE SOUNDS INSPIRED BY SURF GUITAR, PUNK ROCK, PSYCHEDELIA, PSYCHOBILLY, GRUNGE, SHOEGAZE & ALTERNATIVE ROCK. 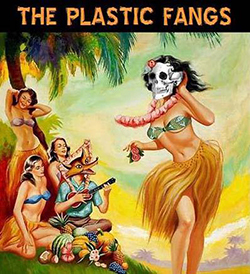 Take one part insane Surf guitar with a punch of dirty Punk Rock and Grunge, and you have, The Plastic Fangs! Out of Brisbane, this trio have a unique, raw, catchy sound, filled with energetic, anthemic songs based around frenetic surf guitar inspired riffs being hammered into place by driving primal Drums and throbbing bass lines! Intensity, atmosphere and energy are all things to expect when you see the Fangs live! !